I feel like I’m cutting out fabric squares for a quilt but I’m not quite sure how they’re all going to fit together yet. But I know that once I have it all done, I’ll be able to stitch it all together to make a cohesive rough draft. I’m really hoping this makes it easier to write the other chapters. Actually I know it is making it easier because I’m already getting a better idea of how to approach writing those chapters as I work on this first one. That’s why you start with the first chapter and go from there. You need to lay a good foundation before building off of it. The introduction is like the conclusion, it’s the finishings on the finished house. They’re the paint and the decor and the furniture that tell you what things are. That’s why you need to write them last. I think I’m finally getting the hang of academic writing. Now watch, I’ll have a massive block and get nothing done. As you all know by now, I am trying to get my thesis off to a good start. It has been an exercise in trying to figure out how to write it. I have been reading books and graphic novels and taking notes and figuring out exactly what I’m looking at. And I was making no on the page progress. I wanted to have a rough draft of my first chapter done before Monday. Until today I didn’t think that would be possible. I felt like my break was wasted in that sense. But it really wasn’t. I needed to take a break from it and let my brain relax. I needed to remember that I am trying to get a rough draft done, not the final draft. Giving myself the permission to simply sit down and include everything I can think of has opened the floodgates. Both yesterday and today I spent about 2 hours at Starbucks with coffee and Hamilton to add to the lack of distractions and help me focus. I have finally laid a solid foundation for me to build the rest of the draft off of. I think if I take the time to work on it tomorrow, and hopefully on Sunday, I will get close to if not have a flat out done draft by Monday. That is going to be a great way to start off the semester! I have a brain again! This past week has been a checklist that is slowly being checked off. Paper for class. Done. Presenting in class. Done. Other presentation. Done. Last day of teaching for the semester. Done. Last day of attending class. Done. All I have left to do is give my students their final exam. That’s part of why I’ve been posting so much lately. I’ve had more time to allow my thoughts to be about something other than school. But there’s another reason for that. I should also be working on my thesis. Which I have been doing. But I’ve also been posting here, getting materials ready to teach next semester, getting caught up on the dishes, getting prepared to do the laundry, generally tidying up, watching TV and movies, and avoiding working on my thesis. But strangely, saying that makes me want to get working on it! After I go get my laundry started. Seriously, I’m running out of clothing. Ahh, the life of a grad student. Lately I’ve been listening to a lot of Hamilton music. 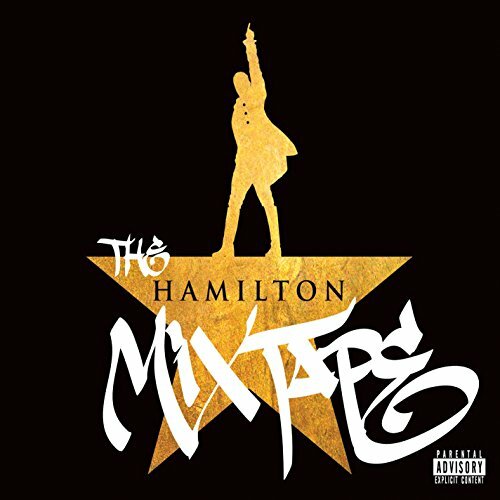 Like many others, I have The Hamilton Mixtape pre-ordered. It comes out on Friday, but Lin-Manuel Miranda has been releasing a track or two here and there over the past couple of weeks. We’re currently at 6 tracks released. And if you pre-ordered it, you get those tracks and pay that much less when the rest comes out. It is amazing. Some of my favorite tracks are some of the more recently released ones. “Wrote My Way Out” is amazing. It’s got four different artists talking about their own experience and how they “wrote [their] way out” of their circumstances. It’s inspiring to listen to. Usher’s “Wait For It” is my other favorite, right now. I love the song to begin with, and his take is just beautiful. Seriously, just go listen to it now. It’s out there on Spotify. Go. Listen. The whole thing is just amazing. “Satisfied” has multiple levels of awesomeness, including Queen Latifah. “Helpless” has Ashanti and Ja Rule, which is so beautiful. I feel like I cannot do it justice because I do not know these artists very much if it all. If you go on Twitter, people are fawning over this amazing music. Today I tried something new. When I listen to Hamilton in the car, I find myself having moments of inspiration about my thesis. The two are nowhere near related. But I think it’s somehow either inspiring the scholarly side or I’ve listened to it often enough that it’s allowing me to zen out and freeing my mind to think about my thesis. So I decided to see if that’s the case of if somehow driving is a part of it. When you’re on a decent drive, it can be a very zen, freeing experience, mentally. I sat down with the laptop and decided to focus on one section of my thesis and write. I didn’t worry about citing or finding the information in books. Basically I was aiming to lay a solid foundation I can go back through and flesh out with the books and graphic novels and such later. I wrote over two-thousand words this afternoon. And they’re really good words. I recently transferred that section over into Word and formatted it accordingly. I wrote almost eight full pages today. That’s without any citations or headings or anything. Just eight pages of words. It’s giving me hope that I can get at least a solid first draft done by the end of the semester to give to my committee to get feedback on. I think I could get a solid draft of the entire thing done over Winter Break when I have no teaching materials to prepare, reading to do for class, papers to write for class, or grading to do. So, evidently Hamilton needs to be in my rotation for writing music. Who knew? As a way to get me inspired to write more of my thesis this month, I have signed up to be a part of NaNoWriMo. NaNoWriMo stands for National Novel Writing Month. The idea is to write a novel in a month, but I have seen others posting about using it to inspire them to work on their academic project. I am following in their footsteps. The ultimate goal of NaNoWriMo is to write a minimum of 50,000 words in the month of November. Considering the inspriation I’m getting from my research, which has been inspired by just thinking and re-rereading the source material, I should be able to hit that point. Also, I’d love to have a solid first draft of the main chapters, not including the introduction and conclusion, before the end of the semester. 50,000 words would get me closer to that being a reality. I realize that would probably be enough words to create the rough draft, but I’m also thinking of editing. So, I’m hoping to update here about once a week with how I’m doing. If you’re also participating, connect with me! I’d love to add buddies. Or just check out my profile and see how my word count is doing outside of my updates. I figure that the more people that know I am doing this, the more there are for me to hold myself accountable to. 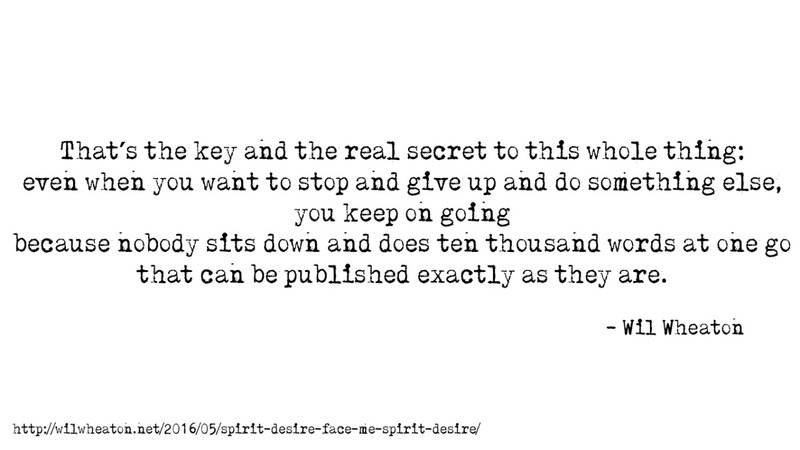 Here’s to 50,000 more words by the end of the month! The more I found out about Hamilton, the more I found myself reminding myself of this. I’m sure this is going to be my mantra when I’m working on my dissertation for my Ph.D. But the best advice I’ve found that’s helped me immensely is from one of my favorite authors, Seanan McGuire. I can’t find the post now, but she posted, I thought on her Tumblr, about using a d10 to keep visual track of her writing. She would sit down and write 1000 words at a time. When she hit 1000, she would take a break and then go back to it. I’ve been using that. I’ll sit down and make myself write 1000 words at a go. I haven’t done it as often as I really should. But I did it tonight, and it feels so good! I really should do it on a daily basis. Then again, it is Monday. Maybe this is the week I start writing 1000 words, minimum, a day. Hopefully it’ll get me motivated to get the basics down and then go back and start fleshing things out, editing, and getting a rough draft done. I keep freaking out over it and not doing anything. The better thing is to get something done that you can ask others, in my case my committee, for their opinions on. They can’t help you if you have nothing for them to look over! Yesterday, my wallet decided to hide out on the backseat of my car. That was part of my problem. Knowing that I had a stack of books waiting for me at the library that I couldn’t get out because my ID was in my wallet was the other. But since I found it just chilling back there after tearing my room apart, things have significantly improved. One of the books in that stack is X-Men and the Mutant Metaphor by Joseph P. Darowski. This is the book I have been trying to find. I’ve been wishing I could find a book that would give me some guidance as to overall stories in the over 50 years of stories in the comics. This is it. I highly recommend this for anyone who enjoys the comics of The X-Men universe. He focuses on the original title, known today as Uncanny X-Men, through issue #500. This book has not only given me guidance as to what comics I want to look at, it has given me focus in general. It feels so good to have my focus back. It feels so good to know what comics I am going to look at in more detail. It feels so good to have a game plan as to what I am including and what I am excluding. It feels so good to know someone else has looked at these comics closely to examine what they say about things we deal with every day. I have focus!!!! Now to get my hands on the other comics! I am blocked. I’ve been trying to do more work with the books I have, but I just…blocked. There’s no other word for it. I think part of it is that I have seven books waiting for me at the library, but I couldn’t get them today. Two or three are about The X-Men, which I have been looking for more information on. That is the biggest challenge with this thesis. I am looking at a comic book that has been around for over 50 years. There are a lot of comics that I could look at. I know I need to look at more, but I don’t know which ones to look at. I’m hoping some of these books will give me some guidance. At least I have peanut butter and apple slices!